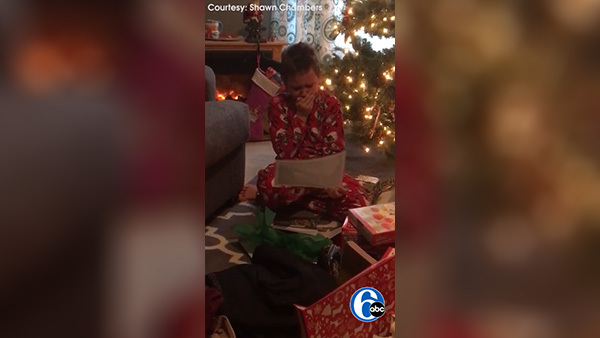 PHILADELPHIA, PA -- 9-year-old Ethan Chambers of Pottstown, a Philadelphia Union superfan, just had a Christmas he will never forget. His parents surprised him with a ticket package for next season and, as the video his father posted on social media shows, it meant a lot to Ethan. His father Shawn tells Action News, Ethan became hooked on the Union after going to his first game last season; it was part of a fundraiser for his soccer team - the Pottsgrove Force. "My wife and I are fans of all sports and he has never really shown interest in watching them, but there is something about the Union that has him hooked. We have a season schedule magnet in the refrigerator and he is constantly checking it to see when the next game is on television," Shawn said. Though Shawn says his son did ask for tickets for Christmas, Ethan's reaction was pure shock when he found out it wasn't to just one game. In the video, Ethan becomes very emotional when realizing just exactly what he got for Christmas. "I could never have imagined this is what the reaction would be," Shawn said. But the tickets were not the only surprise. Ethan also got an autograph from one of his favorite players. "Ethan's primary position is right back which just happens to be the same position Keegan Rosenberry plays. When we watch games together, I am constantly pointing how even as a defensive player you can have an offensive side, as well," Shawn said. Shawn said when he ordered the tickets, he jokingly asked the Union's ticket office if Keegan could come to one of Ethan's practices? In response, the Union said, instead, they could see about getting Ethan an autograph, which, Shawn says, "was amazing." Both the Philadelphia Union and Keenan Rosenberry retweeted Shawn's video. Since Christmas morning, the 9-year-old soccer player has been wearing his Union scarf and has not stopped talking about his presents. "Best gift ever," Ethan has been saying. Also in the video, Ethan's 3-year-old sister Emery can be heard asking if she can attend some of the games. "Anything her big brother does she wants to do," Shawn said.